The U.S. 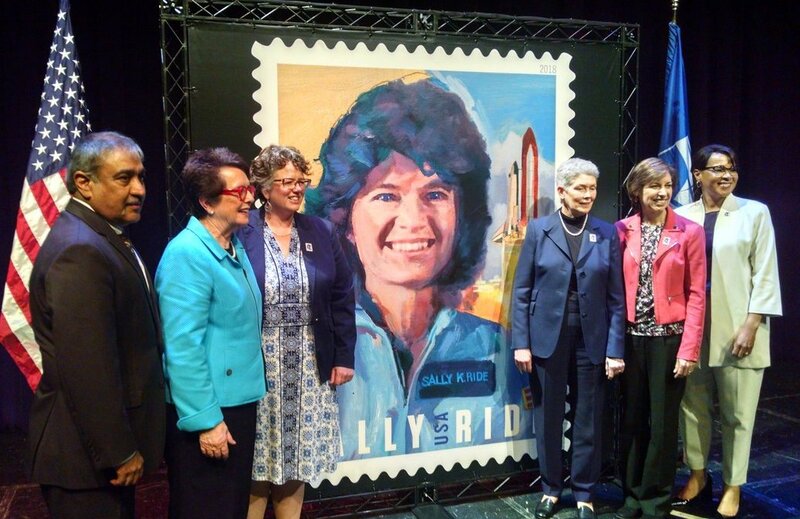 Postal Service dedicated its Forever stamp honoring Sally Ride, America’s first woman in space, in a ceremony May 23 at UC San Diego. Ellen Ochoa, the first Hispanic woman in space, recalled during the ceremony how Ride inspired the women astronauts who came after her. “As much in demand as she was, she always made time to meet with young women who dreamed of becoming astronauts,” said Ochoa, who is retiring as director of NASA’s Johnson Space Center. Paying tribute to Ride were (from left in photo above) UC San Diego Chancellor Pradeep K. Khosla; tennis legend Billie Jean King; U.S. Postal Service Chief Information Officer and Executive Vice President Kristin Seaver; Tam O’Shaughnessy, Ride’s life partner and executive director of Sally Ride Science; Ochoa; and Becky Pettit, UC San Diego vice chancellor for Equity, Diversity and Inclusion. The late astronaut’s 94-year-old mother, Joyce, and sister, Bear, looked on proudly. The ceremony at UC San Diego’s Price Center was followed by a panel discussion on Women in Leadership sponsored by Sally Ride Science and UC San Diego. Taking part in the lively discussion were King, Ochoa and former Secretary of State Condoleezza Rice. The event was moderated by journalist Lynn Sherr, author of a biography of Ride.